Today, we are marking 45 years since the death of Ihor Sikorsky, Father of modern helicopters. Today, on October 26, 2018, we are marking 45 years since the death of Ihor Sikorsky (1889-1972), Father of modern helicopters. Ihor Sikorsky, Ukrainian-born American aviation pioneer and father of the modern helicopter, was born in Kyiv in 1889. His mother was a doctor and his father a psychology professor at Kyiv University. Homeschooled by his mother until age 9, he acquired a love for science through the flying machines in Leonardo da Vinci’s journals and Jules Verne’s books. By age 12, the budding engineer had already built a rubber band powered helicopter. While studying at the Kyiv Polytechnic Institute, he designed two helicopters, among the first such designs in the world, as well as a series of biplanes. On December 29, 1911 he established the world speed record (111 km/hr) for a loaded plane (three passengers), the C-6. From 1912 to 1917 he worked as chief designer at a Russian-Baltic aviation company, where he designed and built the first airplanes with multiple engines. In 1918 he emigrated to France, and in 1919 to the United States, where he founded a number of aviation companies and headed several design teams, which constructed various airplanes and hydroplanes. In 1939 he perfected the design of the first successful helicopter in the world. His Sikorsky Helicopter Co developed military and civilian helicopters, and was considered the world leader in its field. In 1941, the company got its first contract from the U.S. Army Air Corps for an observation helicopter that became known for life-saving missions in military and civil emergencies. 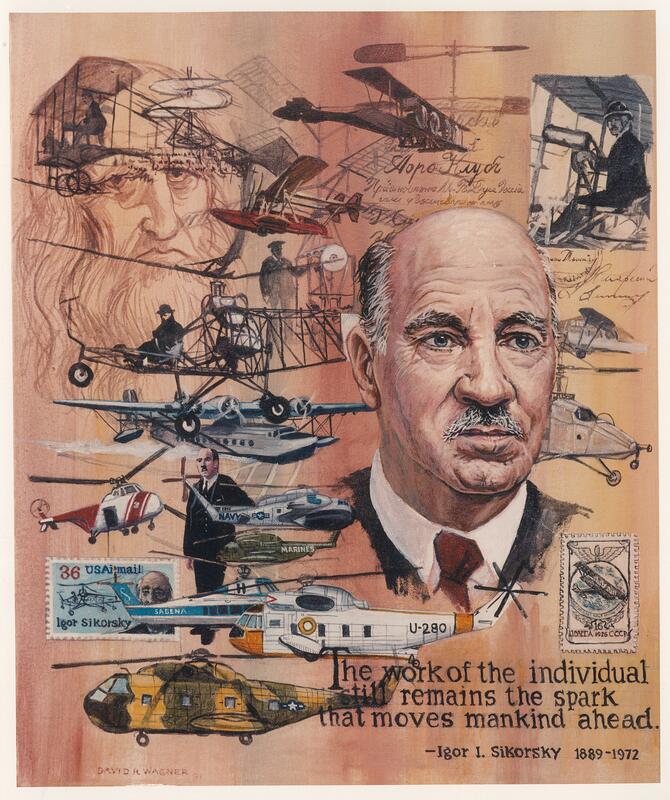 Sikorsky’s active professional life overlapped virtually the entire span of practical flight by man, from the Wright brothers’ inventions to space exploration. Few in aviation can claim such a personal contribution with such a wide range of innovative ideas. He complained that, of all his past predictions, those that he lived to regret were on the “too conservative” side. Sikorsky retired as an engineering manager for his company in 1957 but remained active as a consultant until his death. Sikorsky received many honorary doctorates in science and engineering, honorary fellowships in leading scientific and technical societies in the United States and Europe, and the highest medals and awards in aviation. The company he founded continues today as the largest helicopter maker in the world.